Dame Elizabeth Taylor, 77, a longtime friend of Michael Jackson, is tweeting about her displeasure with tabloid reports that she's so grief-stricken over Jackson's death that she's on suicide watch. "I will always love Michael from the depth of my being and nothing can separate us," Liz writes on her Twitter. "I am a survivor not only for myself, but for my family and for Michael too... Although my grief over Michael could not be any deeper, I am not on suicide watch as some of the cheaper 'rags' would have you believe." Liz adds that she was asked to speak at Jackson's memorial service tomorrow, but declined. "I've been asked to speak at the Staples Center. I cannot be part of the public whoopla," she writes. "And I cannot guarantee that I would be coherent to say a word...I just don't believe that Michael would want me to share my grief with millions of others. How I feel is between us. Not a public event...I said I wouldn't go to the Staples Center and I certainly don't want to become a part of it. I love him too much." 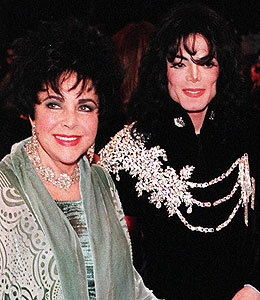 She writes, "My love goes out to Katherine and Michael's beloved children." The Oscar winner had been a close friend of Jackson, having shared the bond of being child stars and international sensations.